Look at the sky above you. Are those long, glittering clouds actually part of a government experiment to poison you? If you believe in chemtrails — a conspiracy theory that's spawned a political movement — then yes. If you believe in science, not so much. We've known that planes form contrails, or long, reflective clouds, since the end of World War I. But in the late 1990s, many people became alarmed by what they believed were new kinds of contrails, dubbed chemtrails, that were being used to change the Earth's atmosphere. What likely kicked off this sudden chemtrail craze was a paper published by the Air Force in 1996, "Weather as a Force Multiplier," where a group of military researchers speculated about how they could use weather manipulation as a form of combat. The paper was explicitly presented as a work of speculative futurism about what could happen in the year 2023, but it raised suspicions in the civilian community. In 1999, environmental journalist William Thomas published an article that popularized the idea of chemtrails, toxic clouds that the Air Force was testing to control the weather for geoengineering. He based some of his ideas on the Air Force paper, but also on a patent filed in 1991 for a "Stratospheric Welsbach Seeding for reduction of global warming." That patent was related to research into the idea that seeding the upper atmosphere with reflective particles might slow global warming by reflecting sunlight back into space. So Thomas work steered the chemtrail conspiracy away from weather control for combat, and into weather control for combatting global warming. But journalists interested in fringe science and the paranormal decided that both the Air Force paper and the patent were probably a tacit admission that the Air Force was already conducting weather-controlling tests. And "chemtrails" were the sign of those tests. Art Bell, whose Coast to Coast radio show covers many fringe science topics, popularized the chemtrail conspiracy even further. The fires were fanned in 2001, when the U.S. Congress considered the Space Preservation Act of 2001, which would have permanently banned space based weapons. In this report, Rep. Dennis Kucinich (D-Ohio), claimed that chemtrails were one of the many 'exotic weapons' being used by the government that should be banned. Many proponents have interpreted this statement to be an admission of chemtrail use by the federal government. But if that's true, we'd have to contemplate the reality of the other threats Kucinich mentioned in the bill, including extraterrestrial weapons, tectonic weapons and psychotronic weapons. The bill never made it out of committee. Today, people in the chemtrail conspiracy community report that they've grown sick after seeing contrails in the sky. Many believed that contrail clouds were a new phenomenon, delivering dangerous "geoengineering" chemicals that were making them sick. They've held large protests in a number of large cities. But there is no scientific way to back up their claims. Contrails are clouds that form when a mixture of warm, unsaturated, engine exhaust gases and cold ambient air reaches saturation with respect to water, forming liquid drops, which quickly freeze. Bassically, contrails happen when cool, damp air of meets warmer air. But the exact temperatures to produce contrails are so precise that you can actually predict where and when they will happen using what's called the Appleman graph. NASA has created a handy explainer to help you find out where the next contrails will appear in your area. Basically, the warm vapor coming out of the airplane jets is interacting with water in the air to create a track of ice crystals, leaving behind a long trail of super-reflective, icy cloud that can persist for hours. 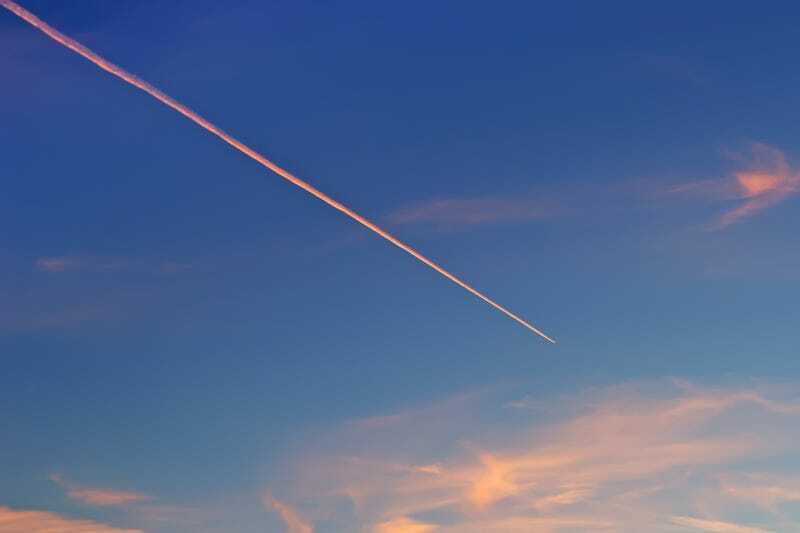 This terrific video from a New Jersey high school can help you visualize what's happening when contrails are formed in the upper atmosphere. What you're seeing is how super-cooled water (like what's in the atmosphere) can turn into ice crystals when it encounters warmer air (like what's in the room where the experiment takes place). Once you understand how contrails are created, it's easy to see why so many of them tend to appear in the skies at once. When the conditions are right, with the perfect temperatures and humidity, pretty much any plane passing through the regions of damp, cool air will leave a contrail. Chemtrail believers say that we may have had contrails for a while, but in the 1990s they became saturated with chemicals that are making us sick. There is no scientific evidence linking the formation of contrails with illness. And the evidence that has come from the chemtrail community is not persuasive. Michael Murphy's frequently-cited documentary, What In the World Are They Spraying? tries to make the case that we're seeing higher levels of aluminum in rain since the advent of chemtrails. Murphy tested the aluminum content of rain by measuring the aluminum content of soil, which he found had roughly 7% aluminum. This amount of aluminum is well within the normal range for soil. Murphy did eventually test rain for aluminum content and got the same result. But that measurement would is well within normal ranges too, because rain tends to pick up dust on its way down to Earth — we would expect both rain and snow to have mineral content that is similar to soil in the region. Indeed, the rain water tested by Murphy shows the same concentration of aluminum as tests conducted on rain water in 1967, well before fears of chemtrails existed. Finally, Murphy and other chemtrail believers say that since the 1990schemtrails are increasing the mortality rate of respiratory illness. Claims by experts in Murphy's film state that respiratory mortality in the US have increased in the past six years directly implying that chemtrails must be the cause of this increase. This statement is very misleading. It's true that respiratory illness is now the third most common cause of death in the U.S., up from fourth place. But this was actually due to a decrease in the mortality of strokes; respiration mortality rates did not change. The fact is that people are suffering from respiratory illness in huge numbers in the U.S., and that is a tragedy. We are also living in an era when researchers are contemplating ways that we could change the weather to mitigate climate change, though there have been no experiments to test these hypotheses yet. But there is no connection between the two things. For people suffering respiratory illness, no matter what you believe, the best thing you can do is get medical help. And if you're concerned about the environment, a good way to deal with that might be to join environmental movements to prevent all the scientifically-measured and quite real threats to our planet from carbon emissions and toxic waste. There are real conspiracies out there, and there is real sickness. But chemtrails don't exist.